Ecco E5 Small Contemporary Mailbox - - a smaller version of our popular E4 contemporary wall mount mailbox. Understated and elegant contemporary design enhances any front porch. 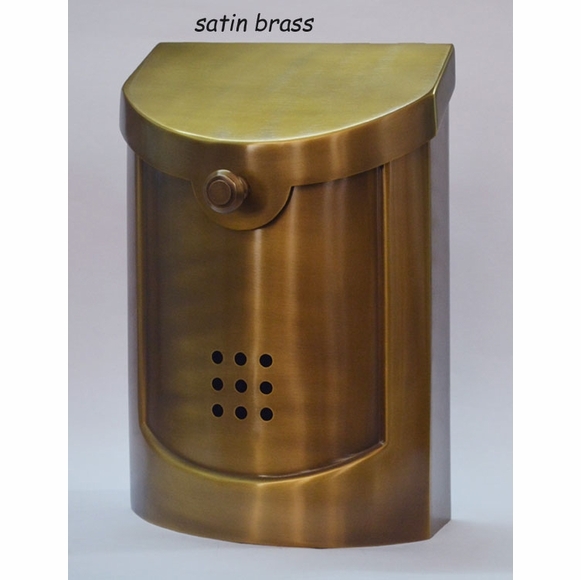 Made of 18 gauge brass and comes in six classic metal finishes to accent your porch or trim colors. After plating, the mailbox is finished with a clear coat of lacquer. Color will darken over time as the finish slowly oxidizes. Dimensions: 8.5"W x 4"D x 12"H; weighs 5 pounds. Colors: antique copper, copper, satin brass, bronze, black pewter, and satin nickel. Also available: architecture numerals to match your Ecco 5 mailbox (see Related Products at right). Thank you to R. Carroll for submitting the image above of her satin nickel finished E5 mailbox mounted next to her front door to go along with her review below. Click on the image to enlarge it. Please send us your picture, too! I just received this mailbox and it far exceeded my expectations. It is beautiful and very well made. I would highly recommend. Very pleased with the product: elegant looking mailbox. Magazines fit perfectly without needing to be folded. Black comir matched our trim perfectly. It arrived timely and in good condition. No issues with installing on stucco. This mailbox is absolutely beautiful! It is heavy weight and well built. It comes with rubber stoppers, to ease impact of top closing. I put a bead of glue on them to keep in place, which worked great. It arrived promptly and in secure packaging. I would highly recommend. ENHANCE YOUR CURB APPEAL IN ONE EASY STEP! Just get this mailbox. It's large enough to hold magazines, small packages and even newspapers, and you don't scrap your hand reaching in to retrieve mail. Well worth the extra cost over big box store mailbox selection. (Comes in two sizes, picture shows small size). This mailbox is fantastic! If you want a classy addition to your front porch then look no further. I ordered this online in bronze and soon discovered that the pictures online don't do it justice. I will do business with Comfort House again! Love it. Sturdy and looks great. Small version has plenty of room for large envelopes and catalogues. Absolutely stunning! Small enough to fit between storm and front doors, but large enough for magazines and small packages. Quick delivery. Far better quality than any options found locally. Highly recommend! We initially ordered the wrong size for what we needed & our inquiry about how to exchange it was handled so well. We really appreciated the efficiency and graciousness. The new mailbox is great, too!